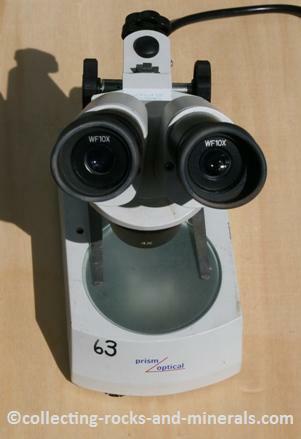 So what geology tools do you need for your home kit? 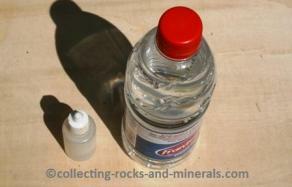 Here are the most important tools for cleaning the rocks first, and then identifying them as well as the minerals. 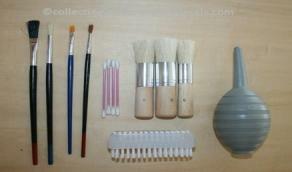 First the rock cleaning tools - brushes, cotton buds, water and other liquids. 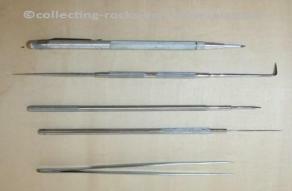 Then the scraping tools - tweezers, needles, chisels and etchers. And finally the rock and mineral identification tools - streak plates, a magnet, a jolly balance, a hardness kit and a microscope. When you first get home with your rocks you need to clean them. Use brushes with different sofness - the softest brushes on soft minerals like calcite, and the hardest ones may be used on hard rocks such as gneiss and granite. Dust blower can be used to blow off dust, and cotton buds are handy if you need to reach into cavities. For most minerals, use water. Distilled water is recommended because tap water can sometimes contain chemicals that may react with some minerals. Some minerals, such as halite, dissolve in water - use other liquids for them. Alcohol can be used, as well as different acids. One of the most widely used acids is weak hydrochloric acid (HCl). You cannot use HCl on carbonates because it dissolves them - this is one of the best ways to identify carbonates ;-) But if there is a calcite stain on the surface of your specimen that you want to get rid of, you can use HCl, and you can also use vinegar. And iron stains can be removed using oxalic acid. Use scraping tools such as etchers, hand chisels, needles and tweezers if you need to get rid of dirt particles in cavities. The scraper is also one of the geology tools that is handy to measure hardness with, once you get the feeling for it. Once you have properly cleaned your specimen, it is ready for identification. Use streak plate to check the colour of mineral powder, aka streak. Streak plate is basically any non-polished porcelain surface. You can use the back side of bathroom tiles, ceramic fuse or the unpolished ring under many plates and cups as perfect geology tools. And you can buy a handy and cheap magnet from the same website. 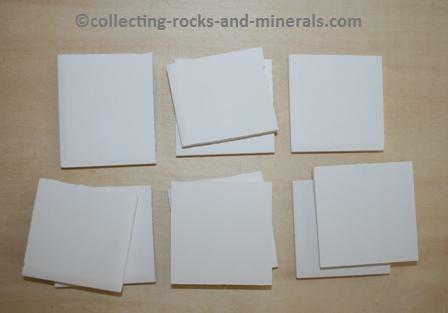 You do want to test if you piece of rock contains any magnetic minerals. 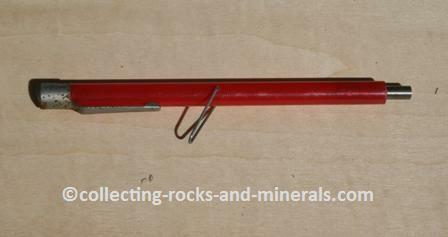 And this pen-shaped tester detects even the weakest magnetism as it is pulled towards the rock while you hold it next to it. There are also the swing magnet scribers with a scratcher and a magnet. 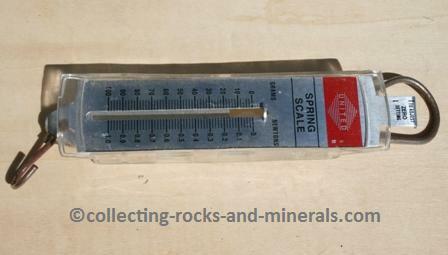 Jolly balance is an instrument that measures your rock's or mineral's specific gravity, aka density. I got mine (this is actually called spring balance but it does the same job) from the university when I did my geology degree. I have been looking but haven't found a website that sells them. Once you have some experience, you can get an idea of density by simply weighing the minerals in your hands. 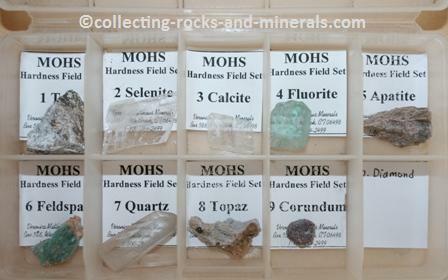 Mohs' hardness kit is one of the necessary geology tools. It is either a bag of Mohs' hardness minerals that you can buy, or it can also be a set of points, which does the same job. Or, you can also make it simple and use a calcite crystal or coins (hardness 3), a piece of copper (hardness 3.5), a steel nail (hardness 5.5), and a quartz crystal (hardness 7). If you scratch any of them on your mineral and it leaves a mark, you know your mineral is softer.